First there were ten. Our two teachers dropped out, because their grant application was not approved. Then, our M.D. was in an auto accident. Another member was unable to do the trek for personal reasons. So, we were six. But only 3 of the 6 made it to Basa Village in the remote region of Solu in eastern Nepal. The day we were to fly from Katmandu to Paphlu airstrip, weather prevented the flight. The next day a plane crashed in the mountains and all domestic flights to eastern Nepal were cancelled. A decision had to be made, and our group agreed with our sirdar (head guide) Sangha that we should take a bus as far east as roads allowed, to Jiri. Then we would hike to Basa and back to the airstrip in Paphlu. This change of plan, however, transmogrified our planned introductory village-culture trek from a leisurely walk-about to a death march (a bit of an exaggeration). We had to do 8-12 hour hikes for 6 days to reach Basa Village in order to make up the time lost. It took us two days to hike from Jiri to Paphlu, which was where the trek was supposed to start. One of our members realized the first day that the was not sufficiently conditioned to maintain the pace. He was slightly hypothermic that night, and so had a rough time on and off the trail. One of our porters was assigned to him, and the two of them hiked at a leisurely pace to Paphlu. Another member pulled a muscle the second day, and hiked for two more days in excruciating pain, but was forced to give up when he reached Paphlu. A third member graciously decided he would look after the other two at Paphlu, and the three of them flew back to Katmandu the day before the other three of us made it back to Paphlu on our return from Basa. The three of us who made it to Basa had an extraordinary experience. We were only the third group of "white people" who have visited the village in living memory. 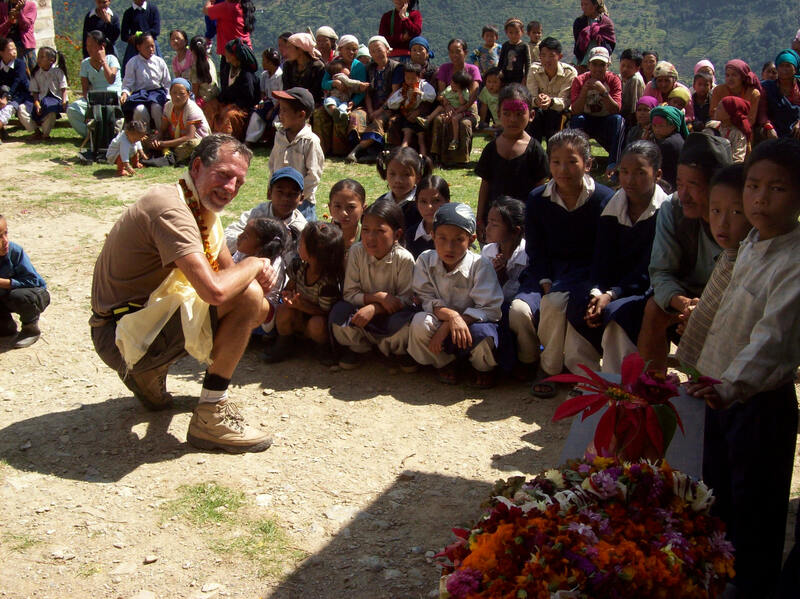 Canadians helped to build a school in the village ten years ago. A French group helped to add a second building to the school last year. These are the only other Westerners the villagers have seen. 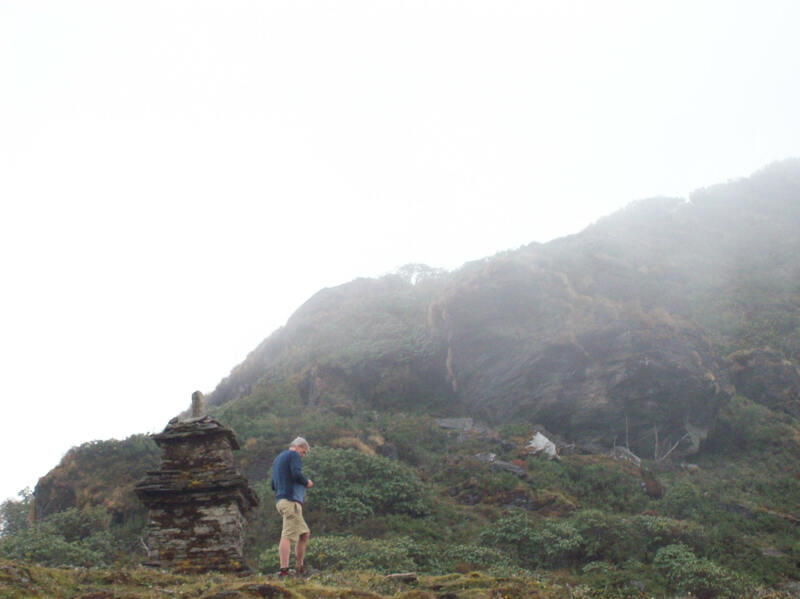 Basa is in a remote valley in an area of Nepal not visited by tourists, trekkers or climbers. We were greeted outside the village by elders playing homemade instruments, who led us down into the village. A welcome arch twined with flowers was at the edge of the village. All of the villagers awaited us with flower garlands, which they placed around our necks in such quantity we could barely see over the leighs. The elders gave welcoming speeches and thanked us profusely for $1400 friends of mine have donated to the school's fund. (I have promised to raise $5000 total for the school. See below.) After the welcoming ceremonies, we visited several homes where we were given much more rakshi (home-distilled liquor, the traditional drink offered to guests). It tasted good, and getting high in the Himalayas on rakshi after 6 days of challenging hiking was just what we needed. That evening, the children performed traditional dances for us. Before we left the next morning, the whole village turned out again to see us off. Speeches were made, rakshi passed around, and flower garlands piled on us. Children held our hands as we hiked up the trail leaving town, and women kissed our cheeks and wept. The little band tootled and thumped their instruments as they led us up the trail above the village. Back in Katmandu, I was able to meet with Niru Rai and Uttam Phuyall, my friends in Katmandu who oversee the account for the School Project funds. We worked out a budget for the remaining funds to be raised. It is agreed the 4th and 5th grade teacher salaries will be paid for 3 years, the old school building's interior and window frames will be painted, the broken floor patched, a playground and safety wall built, new student benches built, and workbook materials provided for the students. The village has no electricity, heat or piped-running water. There are no vehicles, machines, or anything that uses wheels. The people of Basa live pretty much the same way their ancestors lived 500 years ago. The school building's windows do not have glass, and the students sit on wooden benches with no desks or worktables. The teachers, who are village women, have no materials, except a chalkboard. The playground is a hard dirt-patch. But the children, like so many in remote Nepal villages, are curious and want to learn. While the villagers have little material wealth, they have a deep appreciation of hospitality and beauty. Every family has a flower garden, and each family member made two flower garlands for each of us. If you are interested, you can view my photos from the trek. If any of you have questions about the School Project and would like to donate to it. Please let me know. Subject: Basa School Project: We did it! I mailed a check to the La Campagne Ministry account today in the amount of $3,170.00. Separate donations have been sent either to the Ministry's account or to the School's account in Nepal in the amounts of $1,000.00 (Bob-CICF), $445.00 (Mika), $185.00 (Dave's ticket refund to Niru), $1375.00 (check I delivered in Oct). A total of $6,300.00 was raised for the School Project, and over $6,100.00 will be used for the benefit of the School after bank fees are paid and La Campagne charges 2% for its administrative services. The school will be able to complete the renovations planned, build a playground & wall, and pay two teachers' salaries for three years, per the $5000.00 budget plan. In addition, a compost toilet will be installed for the School and Village at an estimated cost of $500.00. Niru, Uttam and I will be discussing what additional things we can do for the School with the amount raised over the goal. For example, we have not yet shipped the educational materials John obtained from the IN Dept. of Ed, so we may hold some amount to cover those costs. I will let you know what else is done with the monies raised.